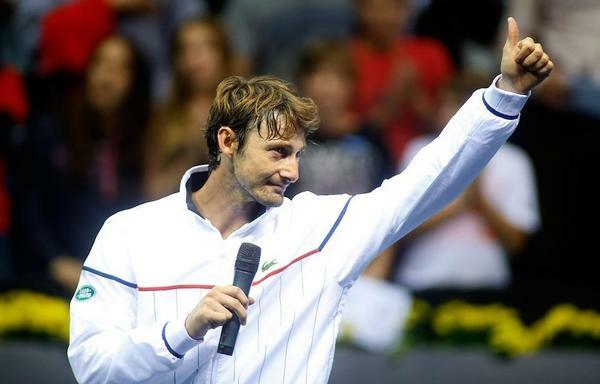 A former world number one who won the French Open in 2003 but was hampered by injuries throughout his career, Ferrero announced last month he would retire after playing his home event. Sixth seed Almagro, 27, Ferrero's junior by five years, had too much power and speed for his mentor in an entertaining match in which the pair exchanged smiles and jokes. The younger man seemed to be suffering from a right shoulder problem late in the second set but shrugged off the injury and sealed victory on his first match point when wildcard Ferrero netted a return. The pair embraced at the net and the 32-year-old was given a rousing ovation by the crowd as he fought back tears before flinging his racket, shirt and various other personal items into the stands. "It's been a long time since I enjoyed myself so much on a tennis court," said Ferrero who will join up with singles top seed David Ferrer in the doubles on Wednesday. "It was an honour to finish my career playing you, I think you are a great champion," he told Almagro whose coaching staff he will join on a part-time basis next year. "I simply want to thank everyone for all their support, not just this year but throughout all the years I have played here," Ferrero said. "It's always been a very special tournament for me and this year even more so." Almagro paid tribute to his friend. "Maybe it was the most bitter win of my career as a great tennis player is leaving us," he said. "I hope he'll be with me for a few weeks next year and I think we'll have some fun. I still have a lot to learn from him." spanish players are all mostly into injury! will miss u Ferrero! god bless!! Just I would liked to understand what all of the players said to Ferrero. Thanks Yami for sharing,but you made me cry a lot...I hate to hear about the retirement of any athlete, especially the Tennis players, it makes me think of Federer and this increases the crying.